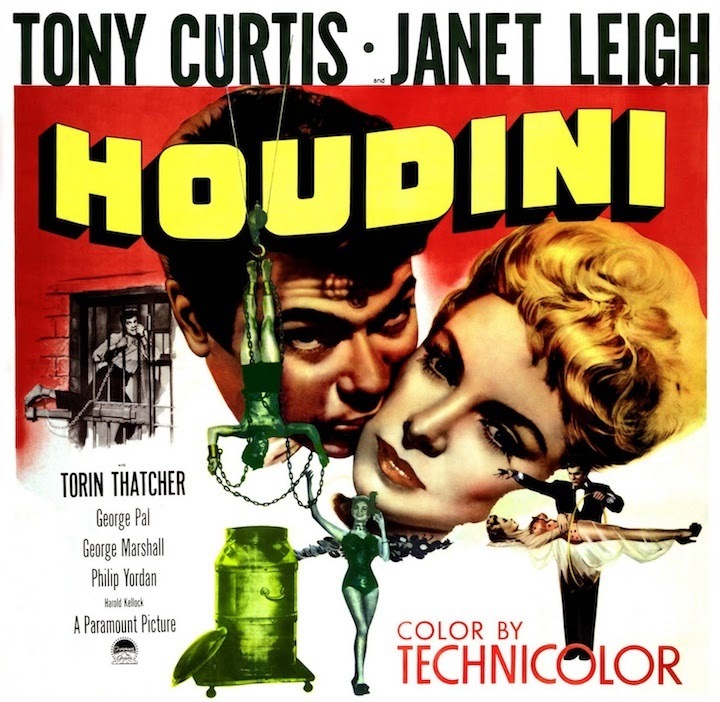 I have a personal annual tradition, on Halloween each year I watch the 1953 HOUDINI movie starring Tony Curtis and Janet Leigh. This was the movie that first inspired me to get into magic and search out the life and world of Houdini. IF you're new to The Magic Detective, my name is Dean Carnegie and I'm a full time magician and have been for nearly 20 years. Let me tell you about my early days and how this movie played a role in my magic life. 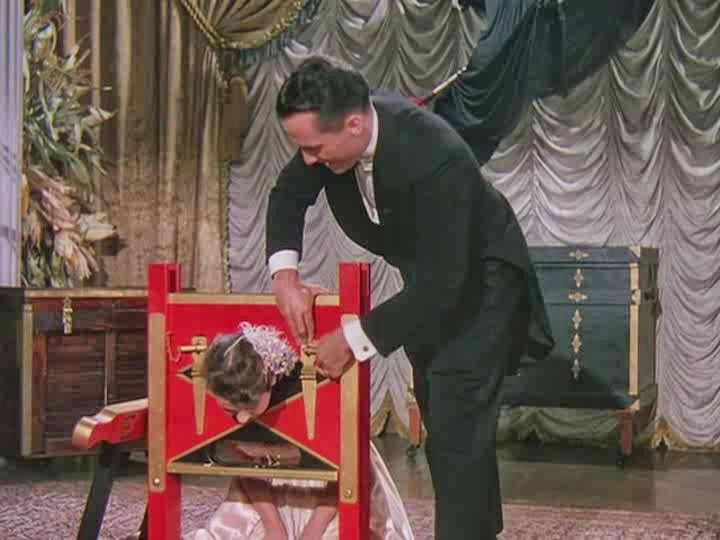 The movie starts with a fun scene with a young Houdini performing as part of a side show. Among the tricks he does is vanishing some milk and turning it into evaporated milk. Seeing this tonight sparked a great deal of memories that I had long forgotten. The memory of a young 7 year old boy pouring milk into a paper cone, only to have it gush all over the kitchen floor. Then only a couple years later to add the Vanishing Milk to my early shows....doing it the correct way at that point. I remembered my fondness for Hamburg 8 handcuffs, and that was due to the scene in the movie where Houdini is short some money and his wife questions him and he says he had a chance to get 'a bargain' and produces the cuffs. A moment later he escapes from them and I remember being quite struck with the way that escape was done. Tonight as I was watching the movie and recalling my first set of Hamburg 8s it occurred to me that my cuffs may have been stolen about a year ago today. When I say stolen, it's more likely that I forgot them and someone picked them up and they're gone now. I've searched a number of times for them and I can't find them anywhere...though my storage unit is a nightmare so they might still be there. often, Bill Larsen. This is the very same Mr. Larsen who would later go on to run Genii Magazine and along with his brother Milt, the Magic Castle. 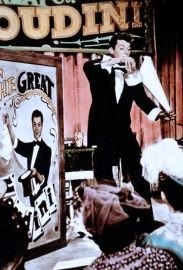 Bill appears in the movie during the scene where Harry and Bess attend a dinner which turns out to be a Halloween Magicians Dinner. That also triggered the memory of meeting Mr. Larsen for the first time. Not at the Magic Castle however. It turns out that the very first time I went to see Le Grand David in Beverly Mass, that Bill and his wife Irene were also attending for the very first time. I saw Mrs. Larsen standing by herself in the back of the theatre and I looked around and sure enough there was Bill Larsen. I went up and introduced myself and got to speak with him for several minutes. Sadly, that was the only time I would ever get to meet Bill. But his kindness and all his advice he had given me through his letters have always meant a lot. One of the many wonderful things about this movie is that Tony and Janet actually do perform a lot of the magic. 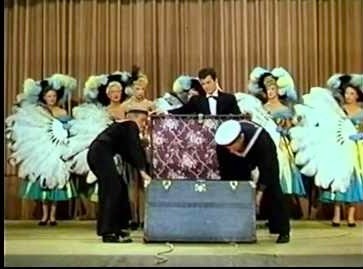 There is a scene were the are performing the Houdini-Metamorphosis trick, also known as The Substitution Trunk or Sub Trunk. It's a great scene and if you watch closely you'll see Janet Leigh struggling to catch her breath during the shot. The whole scene is shot with one camera I believe, no cut-aways. Now as strange as it is, I never really added the Sub Trunk to my show. I did perform it a couple times, but I think because so many other acts were doing the sub trunk I just left it out. That didn't stop a young 8 year old magic fan from doing escapes from trunks. That's right, my first magic show that I ever did featured and escape from a large blue box, which was actually my toy box that my Dad had built. I had my brother and best friend Billy wrap the outside with ropes and chains and locks and I escaped at the end of the show from this trunk. I didn't have handcuffs at the time, so my hands were wrapped in a bicycle chain and I got out of those as well. I was a daring 8 year old. Years later I actually built a sub trunk with my Dad. But again, rather than use it as the regular Substitution Trunk routine, I used it as a packing box escape. I would leave the box and the lid at a venue for examination. We'd put a big poster on the box promoting the show. Then at showtime I would climb inside that thing and get out. I still remember the reaction from a friend who had hired me to do this very thing. I knew he had spent a good deal of time with the box and the lid and he was dumbfounded when I got out. Come to think of it, that was a Halloween gig too. from the Pagoda Torture Cell. In the scene two gentlemen come up with a challenge restraint, a Steel Straight Jacket. Oh my God, that was the coolest thing I had ever seen! All my life I always wanted one of those. Then...I got one. I was no longer 8 years old, lol. 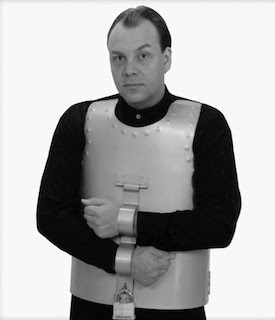 The first routines I did with the Steel Straight Jacket were similar to what was done in the movie. I did that for a while until I realized there was more that could be done. In one show, I presented the SSJ kind of like the sub trunk, in that I was in the jacket first, and then a few moments later, I was free and the jacket was on a friend of mine. Still later, as my mind moved from thoughts of magic and into escapes, I saw the potential for even stronger routines. I used the SSJ to close the show at my Underground Magic Theatre for one season. That was also the year that I met Steve Baker the famous escape artist known as Mr. Escape. I sent him a video of the routine and we talked about ways to improve it further. He had so many fantastic ideas and there was no way to include them all. But the key ones I did eventually use. The last time I performed the SSJ was at the National Theatre in Washington D.C.. I performed it two times and during the first show wanted to test out an idea. I had always heard that modern audiences would not sit through long drawn out escapes like they did in the time of Houdini. But I always heard this from folks who didn't do escapes. So I figured, why not test the theory. I struggled and struggles and even tore my shirt and did some very unorthodox things to get out of the jacket. The audience sat there spellbound. In the show that followed I did the SSJ again, but this time without all the lengthy drama. There were people present who had seen both shows and they immediately asked about the difference in the performances when it was over. They were very intrigued and frankly, I was thrilled with their interest. At the conclusion of the movie, Tony Curtis as Houdini dies trying to attempt the Pagoda Torture Cell or what we know as the Water Torture Cell. This scene and an earlier scene where Houdini is trapped under the frozen Detroit River after doing a packing box escape, made me very aware of the dangers of escapes and water. But it didn't stop me, I was just careful. I used to practice several times a week escaping from handcuffs underwater. My method was quite ingenious. At the time, we lived on a farm. I would clean out the water troughs that were used for the horses and fill them full of clean water and work on the escapes underwater. My chosen method of escape was picking the cuffs underwater. At the time I was unaware of something called 'bridge jumpers'. But it was still good training. thing you see. Houdini's name written in Black and Red bold faced letters. Don't ask me why this stuck in my brain, but it did. Not long after I had decided to do magic full time, I had a huge banner made with my name written just like that, in black and red letters. It was to promote a series of theatre shows and it looked very cool. It's amazing to think just how much that movie inspired and even shaped my magic career. A lot of it I really didn't pay much attention to, but now that I look back, it's quite ironic. And to think, most of that movie was fiction! What kind of trouble could have I gotten into if they had made a truthful movie??? Well, they did eventually with Paul Michael Glaser. That movie was called The Great Houdinis. And yes, that movie also played a part in my early magic years, but that's a story for another time. Great post. Thanks Dean. I love how this movie inspired so many of us to get into magic/Houdini. Where did you get the steel straitjacket? I custom ordered it from Mark Cannon. I believe it was actually built by Ian McColl of Australia. I actually purchased a second one, but later sold it. I dont know how many were made, I don't think there were a lot. From what I've seen of others, mine is slightly different.